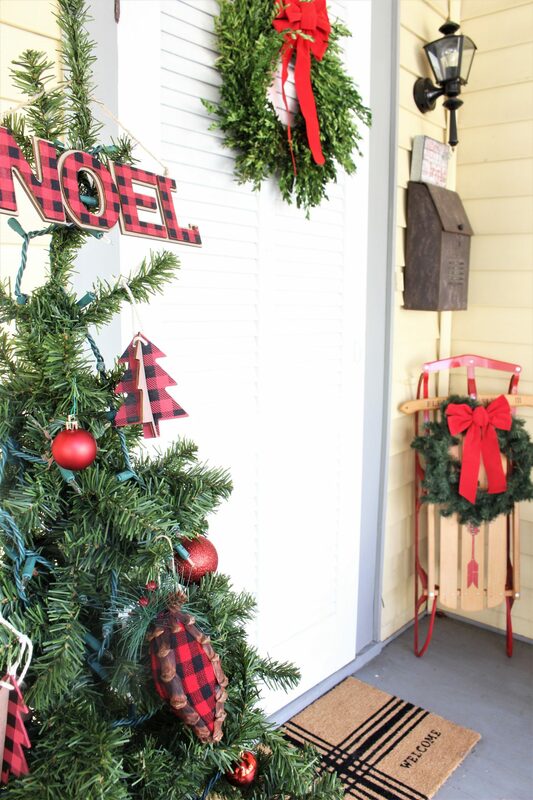 Today is all about Christmas on the front porch! We’re so excited to finally be showing y’all what we’ve been up to the past few weeks. This week we’ll be sharing quite a few of our spaces all decorated for Christmas. What better way to begin than with the front porch?! 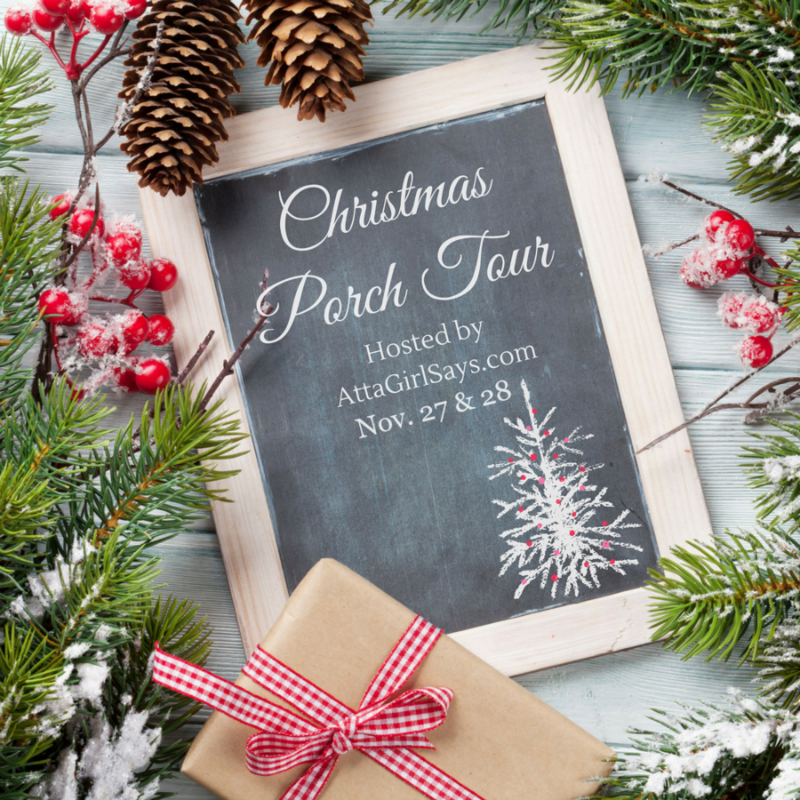 We’re also excited to be participating in this years Christmas Porch Tour, hosted by Amy from Atta Girl Says. If you’re new here, welcome! And if you’ve been here before, we’re so happy to have you back! 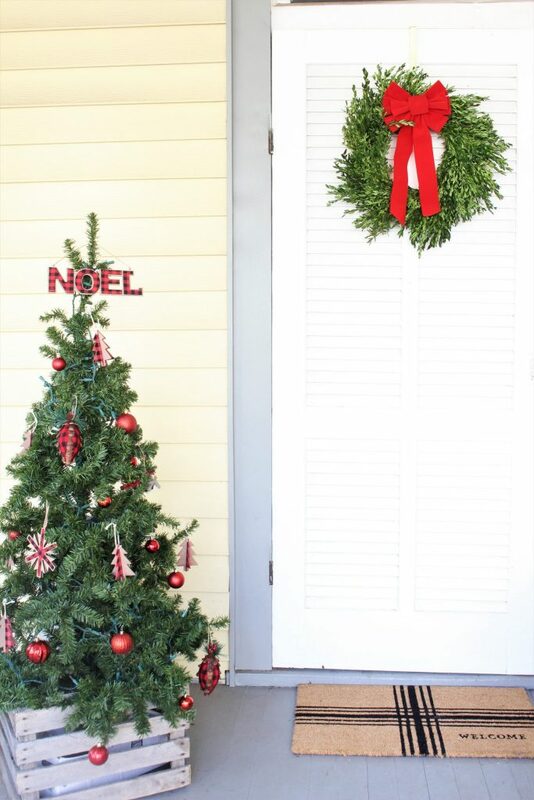 I love adding pops of red during Christmas and it really does make everything so much more cheerful. 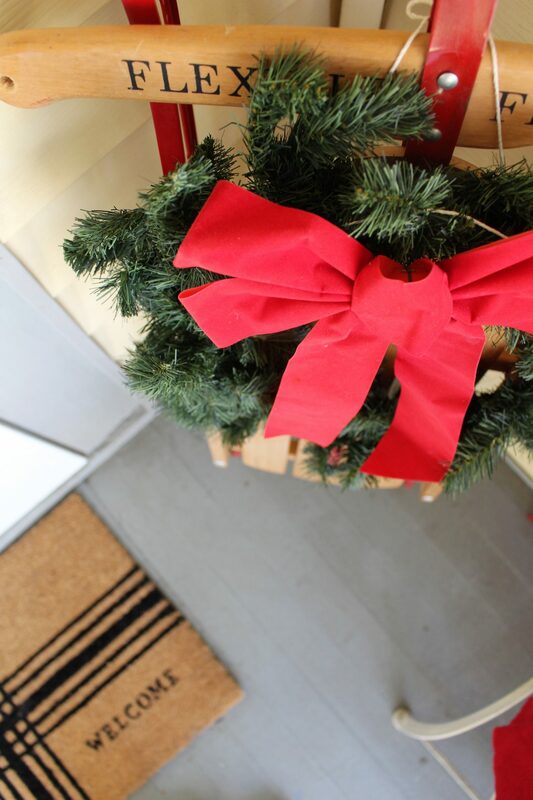 There can never be enough red bows, blankets, ornaments…you get the idea. Mom made this adorable Santa pillow, that in all honesty I may have stolen from her haha! You can see how easy it is to transfer graphics to pillows here. Truth be told, this sled was mine when I was a child, so it is about 25 years old. Is that considered vintage now? I hope not! 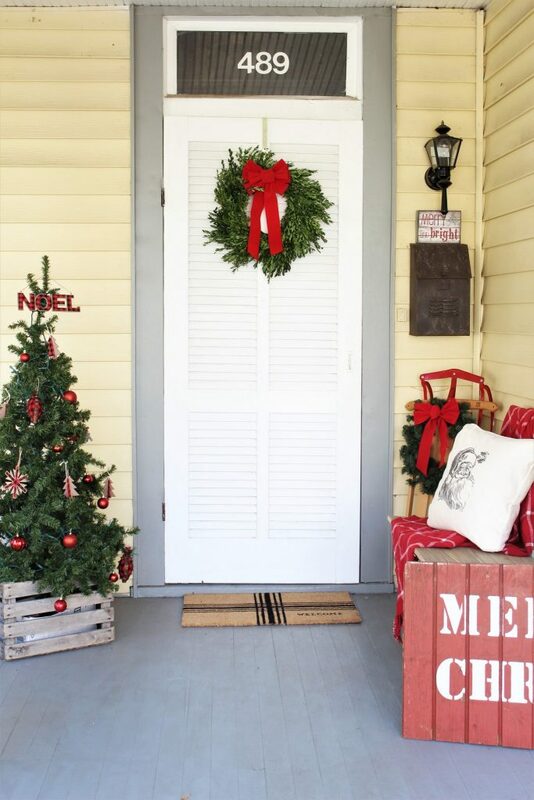 Are you a fan of boxwood wreaths? I got this from Trader Joe’s the day they came out because I knew they would be bought up. Now the hard part is keeping it alive through Christmas. I also love the rustic wooden crate that the tree is in, which was a curbside find. Those are the best! Last year in the dining room I did a buffalo check theme, which I loved. Also, I wanted to be able to use some of those ornaments in my decor this year and thought they would be perfect on the front porch. I made this rustic Merry Christmas sign a few years ago from a piece of wood that was left in our old house when we moved in. It will always has a home on the front porch. And I of course had to include my new welcome mat from the Hearth & Hand collection at Target. I just love it! 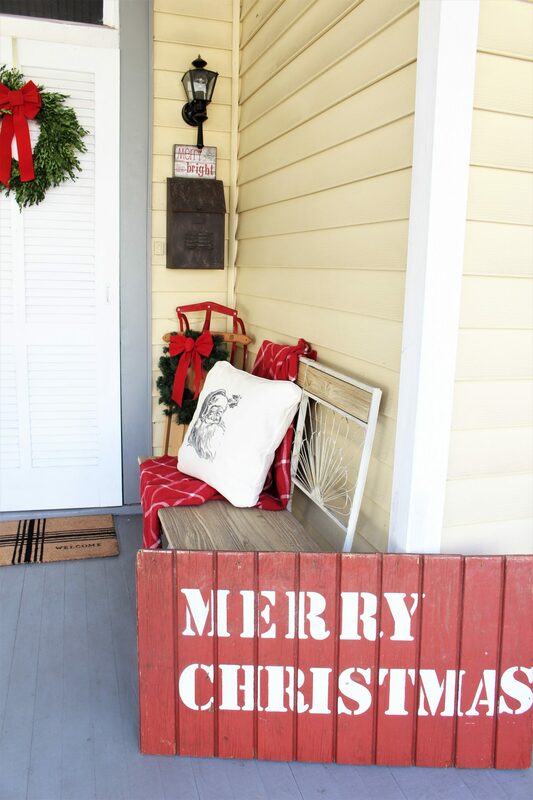 Thanks for stopping by and enjoying Christmas on the front porch with me! Prepared to be inspired with these festive Christmas decorating ideas for your front porch, sunroom, screened-in porch or gazebo. Love it! Cute, cozy and creative! Your porch is beautiful as always! 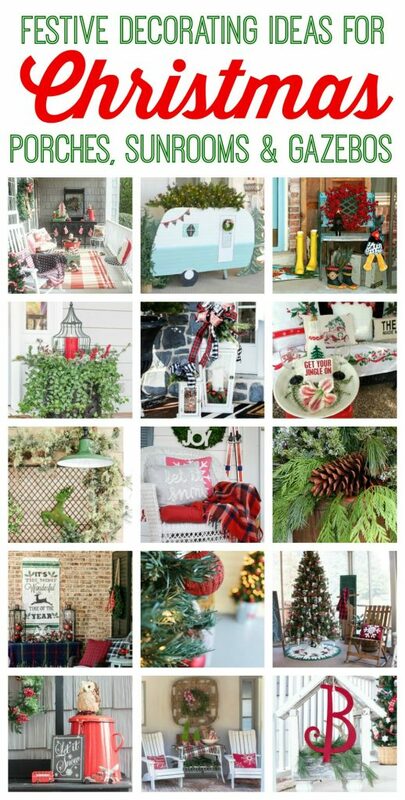 Love all the holiday touches!!! Happy holidays! Very cute porch! Loving the sled. And no, 25 years isn’t ancient or anything :). 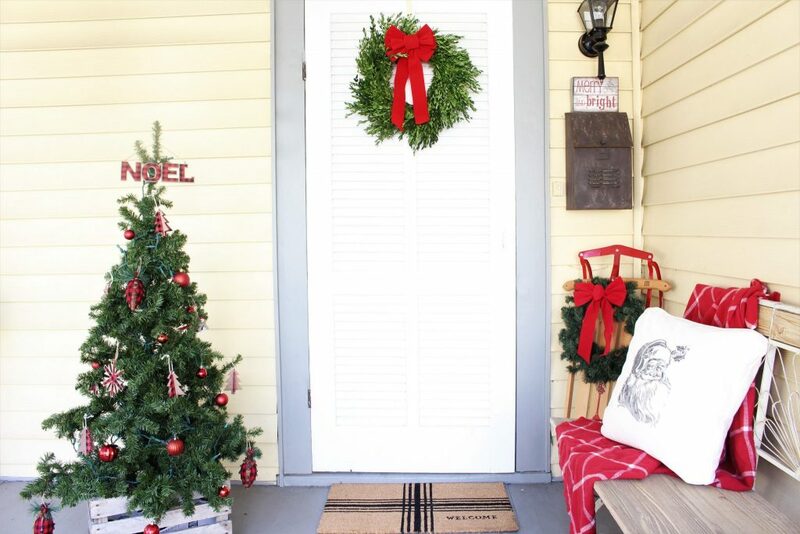 Your porch looks so festive and inviting for Christmas! 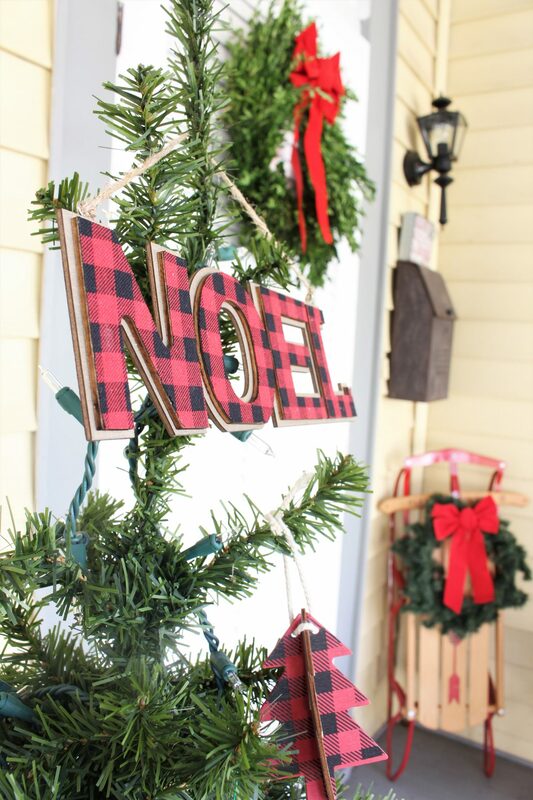 Buffalo check is perfect for Christmas and your tree looks great by your door loaded with those cute ornaments. I look forward to seeing more of your decor this Christmas season. 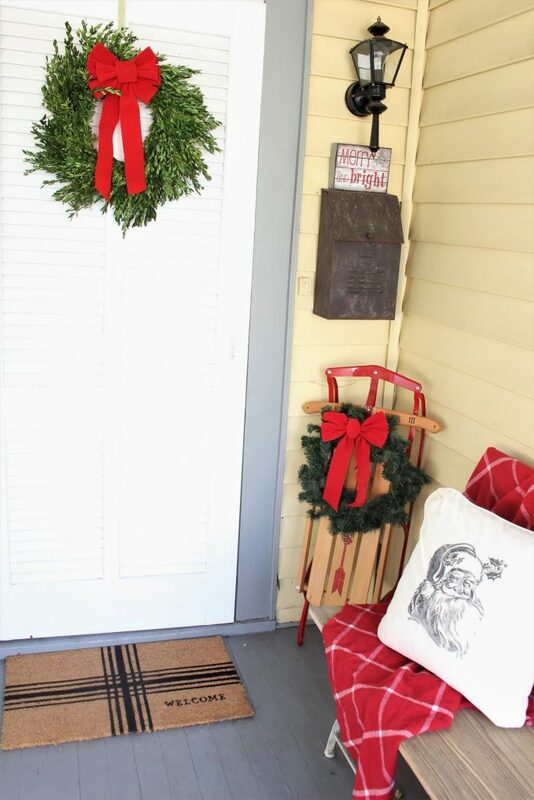 Your porch is so festive and cozy, Jenn. I love that pillow. I would have stolen it too! The buffalo plaid looks so pretty too. You shop like I do: mom’s house, curbside, Trader Joe’s and Target! It all combines beautifully on your front porch. I love all the red with your buttery yellow paint; Christmas red coordinates with everything. And the buffalo check might be my favorite pattern ever! Thanks so much for being part of my porch tour! Can’t wait to tour the rest of your holiday home. 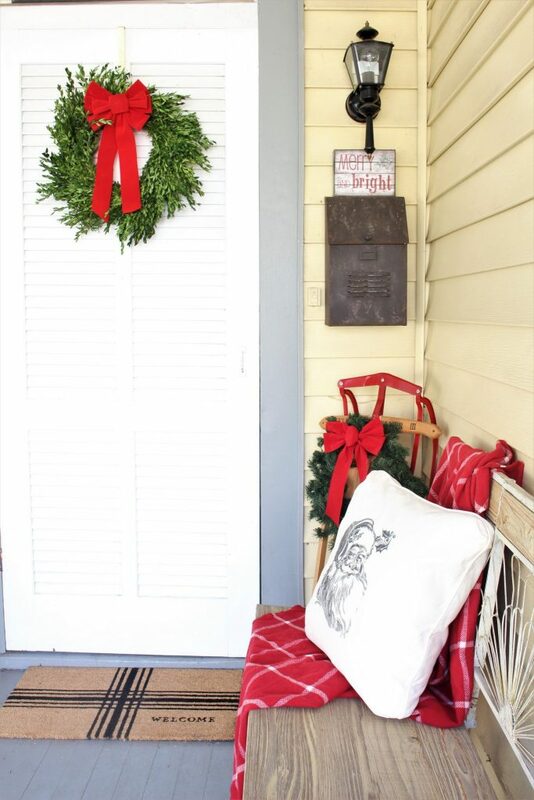 What a pretty, welcoming porch!! I adore the pops of color and that red sign!! Merry Christmas!